"Watch the video below for a look into acoustic telemetry research and the GLATOS network, one of the most innovative elements of the Commission's research program." With six quadrillion gallons of freshwater in the Great Lakes, it's nearly impossible to keep track of the innumerable fish that call the lakes their home. Yet, understanding fish behaviors is critical to improving how their populations are managed in an ever-changing system. Scientists have been left to hypothesize the answers to endless questions, including: Where do fish spend their lives? What migration patterns do fish follow each season? Where does fish spawning occur? Thanks to the Great Lakes Acoustic Telemetry Observing System (GLATOS), researchers and the public can find out the answers to these questions and more. 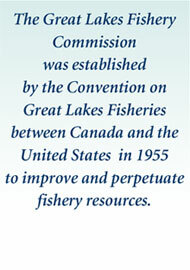 With support from the Great Lakes Restoration Initiative and the Great Lakes Observing System, GLATOS was created by the Great Lakes Fishery Commission to study the behaviors, movements, and interactions of important fish species in the Great Lakes using innovative acoustic telemetry technology. With the detailed information provided through GLATOS, scientists are able to track fish movements with remarkable precision and uncover the previously unknown lives of Great Lakes fish species. Watch the video below for a look into acoustic telemetry research and the GLATOS network, one of the most innovative elements of the Commission’s research program. Description: Innovative acoustic telemetry technology is used by scientists to study the behaviors, movements, and interactions of important fish species in the Great Lakes. Acoustic telemetry tracks the movement of internally-tagged fish using a network of underwater receivers located strategically along fish migration routes, spawning areas, and other places of scientific interest. As a fish swims near a receiver, the internal tag transmits, or “pings,” a unique ID number, which is logged by the receiver. The receivers – small data-logging computers also called hydrophones – listen for pings and record the date, time, and ID number for each tagged fish that swims by. The vast GLATOS network consists of more than 500 receivers and more than 5,400 tagged fish of 33 different fish species. To date, more than 168 million pings have been recorded. These records supply researchers with valuable information to improve monitoring, control, restoration, and management efforts in the Great Lakes. If you are interested in learning more about how acoustic telemetry us being used to protect and improve the Great Lakes fishery, visit the GLATOS website. On the website, you can explore a map of receiver locations and read more about current acoustic telemetry projects. For more information, click on the hyperlinks within the text.